Resource center What Is Harm Reduction Therapy? How Do Needle Exchanges and Injection Clinics Operate? Safe injection clinics (or safe injection sites) and needle exchange programs have their origins from the harm reduction model. Harm reduction (HR) is a model that proposes strategies that are aimed at reducing negative consequences associated with addiction and substance abuse, but it does not force treatment on people. The HR model opposes traditional treatment philosophies to dealing with substance abuse, such as the philosophy associated with 12-Step group program like Alcoholics Anonymous or medical associations like the American Medical Association. Instead of proposing that addiction is a disease that must be treated, the HR model makes the assumption that people have the right to engage in drug use if they do so in a safe manner. Harm reduction assumes that, for the most part, drug use is a choice, though there are some qualifications to this. The use of illicit drugs is part of the diverse behavior that occurs in the world. Harm reduction programs attempt to minimize harm associated with drug abuse rather than condemning individuals who use drugs. The use of drugs represents a complex behavior that can be rated on a continuum from being totally abstinent to having a severe addiction. There are safe ways to use drugs, and there are unsafe ways to use drugs. The preferred policy associated with drug use is to concentrate on the quality of the drug user’s life and the wellbeing of the community as opposed to attempting to stop individuals from using drugs. Harm reduction promotes the use of nonjudgmental and non-condemning resources for individuals who use drugs and their communities in order to reduce any potential harmful effects of drug use/abuse. Drug users should be allowed to participate in the creation of programs and policies that affect their behavior. The drug users themselves are the agents that should be involved in the reduction of harm associated with their drug use. Harm reduction strategies include supporting drug users and ensuring that they receive important information regarding their behavior. Harm reduction programs claim that social injustice is associated with illicit drug use or the vulnerability to develop addictive behaviors. Harm reduction strategies do not attempt to ignore potential dangers associated with drug use or minimize the serious issues that can occur with substance use disorders. The harm reduction model originated at the First International Conference on the Reduction of Drug-Related Harm, held in Liverpool, England in 1990. The HR model was associated with the first attempts to offer open needle exchanges for individuals addicted to heroin, and these efforts led to a worldwide movement. The global organization, Harm Reduction International, was designed to oversee, develop, and implement policies associated with the HR model. Needle exchange programs (and even safe injection sites) provide clean needles and syringes to people who use drugs intravenously. At the time of this writing, the majority of safe injection site programs are outside of the United States. In January 2017, the first of these programs in the US was approved to be opened in Seattle, WA, but there are numerous needle exchange programs available, especially in larger urban areas. Many of these programs supply other types of equipment that can be used to prepare and consume drugs, including mixing containers, sterile water, filters, etc. Many of these programs are sponsored by local substance abuse treatment centers or even local pharmacies. They operate out of both fixed and mobile sites. The sites may not always be able to provide equipment according to the recommendations of major health organizations. For instance, the World Health Organization recommends that each drug injector should be provided with 200 syringes per year. For some programs, this may be an unrealistic goal, whereas other programs may provide more than the recommendation. Needle exchange programs have received support from major health organizations. For instance, in 2000, the American Medical Association (AMA) adopted a position of support for needle sharing programs when these programs are combined with counseling for substance abuse issues. WHO published an extensive report in 2004 that indicated that the available research at the time had demonstrated that needle sharing programs substantially reduce the spread of blood-borne viruses such as HIV, that these programs do not result in increases in intravenous drug use, and that they are also associated with reductions in crime related to intravenous drug use. In addition, the WHO report indicated that needle sharing programs have the added benefit of recruiting individuals who abuse drugs intravenously into drug counseling programs and also tend to get these individuals involved in healthcare programs. 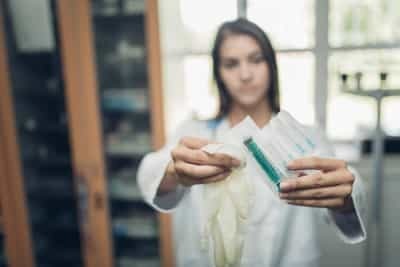 Despite the evidence that these programs are efficacious in reducing the spread of disease, do not increase the incidence of substance abuse problems, and may deter criminal activities, needle exchange programs have remained a controversial issue in the United States for many years. As of June 2015, only 16 states had laws authorizing this practice and federal statutes had prohibited the US government from funding these programs since 1988; many states had banned the practice based on unfounded notions that they increased rates of addiction and the spread of disease. In 2016, several states, such as Kentucky and Indiana, made changes in the state law to allow these programs to be reestablished, and the federal government changed its position on these programs and allowed federal funds to support them. As these programs begin to exert positive benefits in states that have re-instituted them, it is most likely that other states/localities will also begin to support them. There are currently over 200 needle sharing programs in the US, and numerous other sites are being established. The harm reduction approach assumes some strategies that are in opposition to traditional notions of treatment for substance use disorders. However, harm reduction programs, such as safe injection sites and needle exchange programs, do offer treatment referrals for individuals who wish to receive treatment. It should be understood that the HR model does not condone the use of drugs, nor does it condemn the use of drugs. HR does not support the notion of the disease model of addiction. While it is generally not focused on making individuals who do not wish to receive treatment services get treatment, it does offer treatment services for individuals who wish to become engaged in them. The reduction of harm by abstaining from drug use: Individuals who find that their drug use has become unmanageable and wish to stop can find treatment resources and referrals in these programs. Education: These programs provide psycho-educational programs to prepare individuals to enter into treatment if they choose to do so. Use of safer drugs: All of these programs promote the use of safer drugs, such as Suboxone or methadone, over the use of heroin or other dangerous drugs. Moderation: These programs support Moderation Management, which is a program designed to help individuals use their substance of choice in moderation. They also support the Motivational Interviewing theory that assumes that individuals do not all have the same level of willingness to change their behavior. Attempting to understand where an individual stands regarding their desire to change can help place an individual in an appropriate treatment or support program. Both sides make valid conclusions regarding their stances. Supporters of the traditional notion of treatment will often refer to high rates of relapse associated with substance use disorder treatment as evidence that supports the notion that abstinence-based policies are the best approach to dealing with substance use disorders. Harm reduction proponents might counter that high rates of relapse in addiction treatment are more indicative of the failure of abstinence as a goal for treatment. Instead, HR supporters would propose a Moderation Management approach where individuals learn to control their use of their drug of choice. Both sides can offer anecdotal evidence to support their opinions and can produce published empirical evidence to support either side of the debate. Thus, the debate between supporters of a harm reduction model and more traditional notions of substance use disorder treatment will most likely not be resolved soon. The contrasting attitudes of supporters of the HR model and more traditional supporters of the notion of the disease model of addiction, such as AMA, can be seen in the policy instituted by AMA supporting needle sharing programs as long as they also offered counseling for the treatment of addiction. HR programs advocate the establishment of needle sharing programs without any obligations on the consumers of these programs to become involved in treatment, whereas more traditional viewpoints of addiction still adhere to the idea that individuals with substance abuse issues should have some type of mandatory exposure to education and treatment services regardless of their desire to change their behavior. Most likely, these two contrasting philosophies will continue to spar with one another even when safe injection sites, which are heavily influenced by the HR model, become more prevalent. In the final analysis, the harm reduction model does provide useful alternatives for individuals who are not ready to enter into treatment. Community interventions, such as needle sharing programs, help to reduce the collateral damage that can occur as a result of injecting drugs (e.g., reductions in disease and crime, and helping to educate individuals who use these drugs). Thus, while the overall approach of the HR model will most likely never be accepted by the addiction treatment community, the policies adopted by the model do provide useful approaches to the community management of the negative aspects of drug abuse and may help to expand potential treatment alternatives for individuals with severe substance use disorders in the long run.